The South Carolina Association of Health Underwriters (SCAHU) is the professional association for more than 300 individuals in the health insurance industry in South Carolina who market and service health insurance and related products, including group health insurance, dental insurance, self-funded benefit plans, utilization review programs, preferred provider organizations, short and long term disability plans, long term care plans and more. The members of SCAHU come from all corners of South Carolina and assist individuals and employee groups ranging from two to thousands. SCAHU is a state chapter of the National Association of Health Underwriters (NAHU), which has more than 20,000 members nationwide. SCAHU provides its members with state and national legislative representation, continuing education, industry and market information. As the members of SCAHU work directly with the consumers in the day-to-day issues relating to their health and health-related benefits, SCAHU considers itself as a consumer advocacy group. For the majority of our members, selling insurance represents a fraction of the time our members spend with their customers. Overwhelmingly, the majority of our members’ time is occupied servicing South Carolina consumers, such as explaining the complexities and details of benefit plans; working with insurance companies to solve customer claim and administrative problems; and, helping consumers find cost effective and appropriate means for financing health-care. The South Carolina Association of Health Underwriters stands ready to help legislators, regulators and consumer groups in helping them understand the complexities of the financing of health care. Thank you for your interest in SCAHU. Full active membership requires national, state chapter & local chapter affiliation. The South Carolina Association of Health Underwriters is a state chapter of the National Association of Health Underwriters (NAHU). 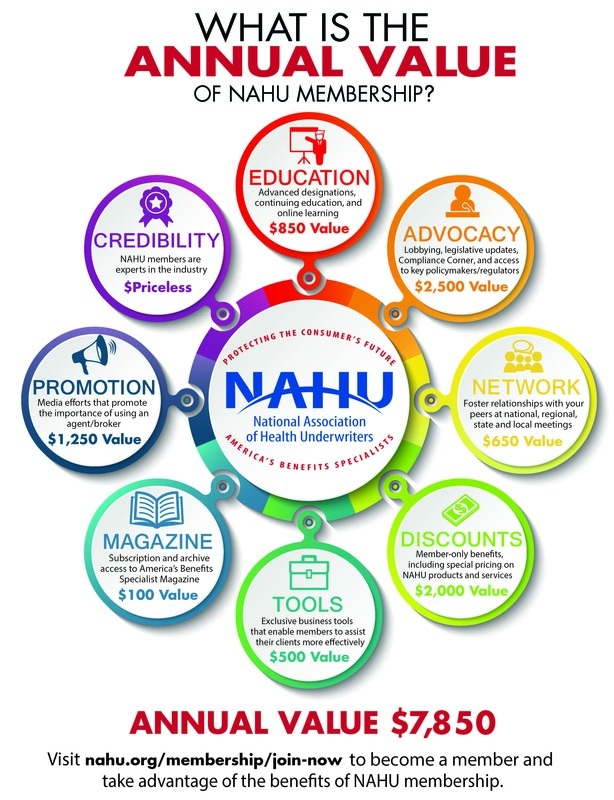 By joining NAHU, you become a member of your state and local chapters. The NAHU annual membership dues are $375 for residents of South Carolina. Of that $375, your state chapter receives $75 per year, and your local chapter receives $30 per year. Dues can be paid in full annually, or dues can be split up into monthly bank drafts in the amount of $31.25 per month. Please remember to list a person who referred you so that they can personally thank you.